Hello and a huge welcome to you! 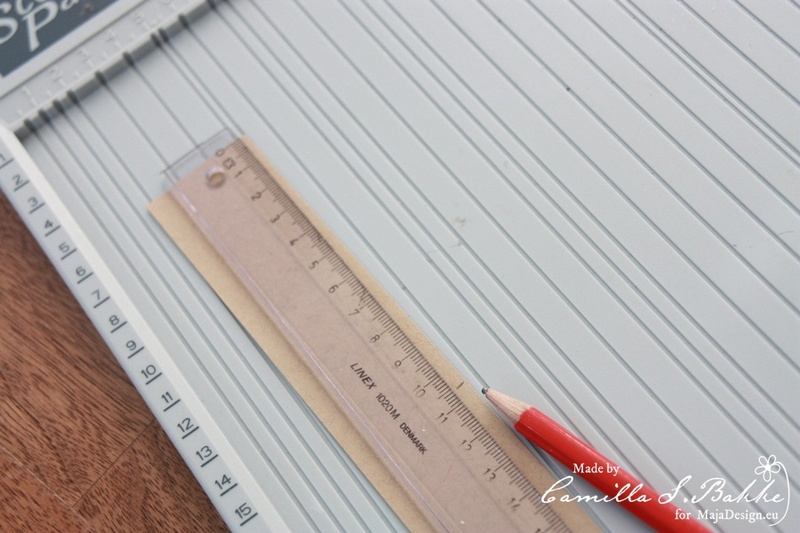 Today I am here to share my next project which I created using Maja’s gorgeous Vintage Spring Basics combined with Coffee in the Arbour. 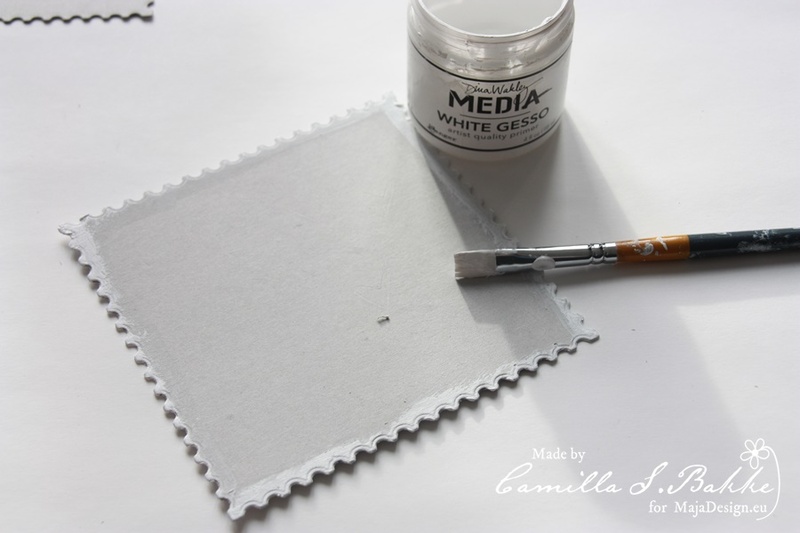 If you keep scrolling I will share a few close-ups and more details of how I used these beautiful papers. I love yellows…….. and browns just seems to be the thing I go to next! So for this creation I came across this photo of my gorgeous youngest daughter and our furbaby Rafael some time ago in the back yard at home. It was one of those lucky shots that it was fortunate that they were looking my way at the correct time. I had printed this photo off a few times and I never liked the way this came out in the sepia tone so I had stashed it away. But for these project the colours fit beautifully, wouldn’t you agree? With papers tearing seems to be a natural progession. My first sheet (background sheet) was Coffee in the Arbour’s Lemoncurd. The soft tones to this paper drew me to it instantly. I did a little stenciling on it but mainly left it’s beauty remain. 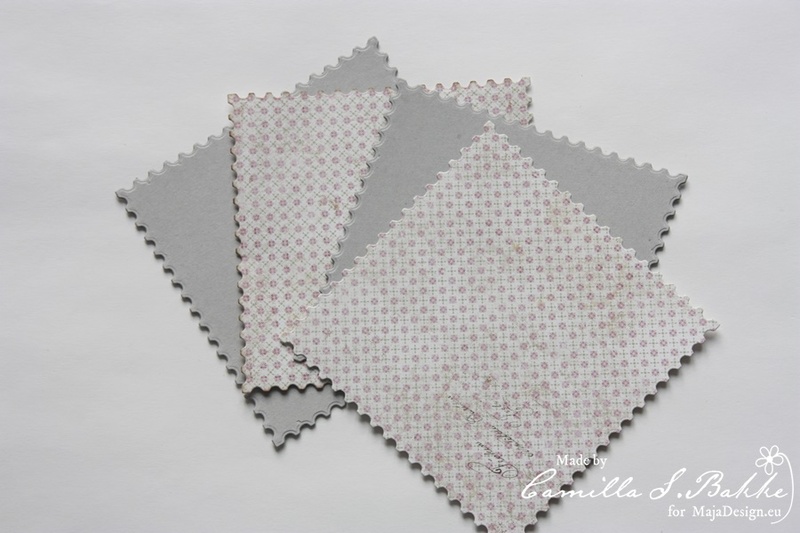 I then cut the frame from the Vintage Spring Basics 1st of March Sheet. Did some distressing and adhered it to the background piece. With the remainder of the 1st of March I did some tearing and adhered the torn middle section to the page. I love the images of the calender and other elements that are this sheet. They are just gorgeous and really lend itself to my project! I also used the back of 1st of March to help the photo pop a little. Again tearing papers to fit the matting of my photo. The other torn pieces were layered amoungst the chipboards and flowers and clocks that I cut from from the Vintage Autumn Basics No.XVI. These were cut carefully and sanded and distressed to give that worn feeling. 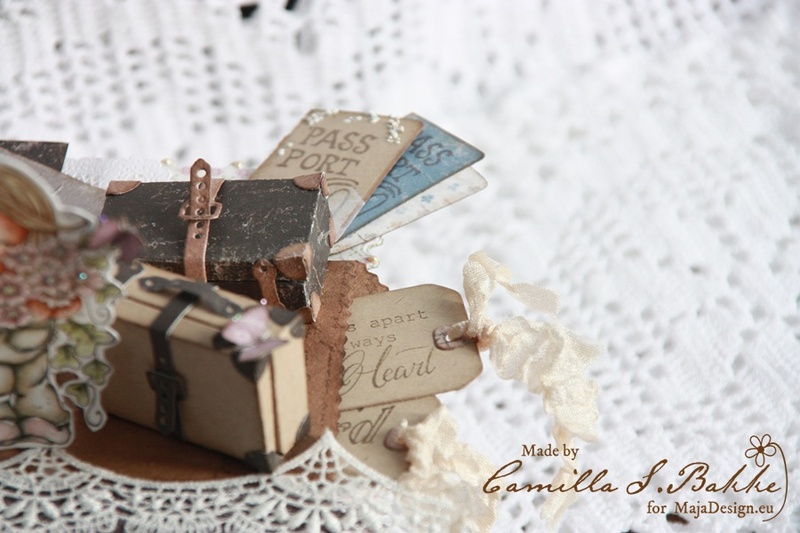 I used some Dusty Attic chipboards inked with Distress Inks and also some paper moulds that I made a few weeks back along with a charm that I picked up in my travels to Taiwan a few months back. I love the simplicity of it. When everything was layered I then dry brushed my elements to soften the page and then added in a few microbeads with some 3D Gel. Cut out two papers measuring 30 x 7 cm. 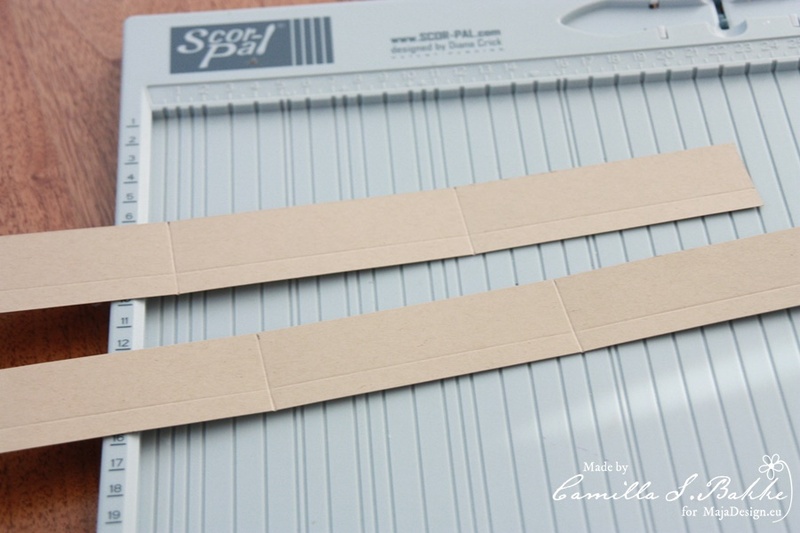 Then fold both at 6 cm. Then fold at 10,5 and 21. 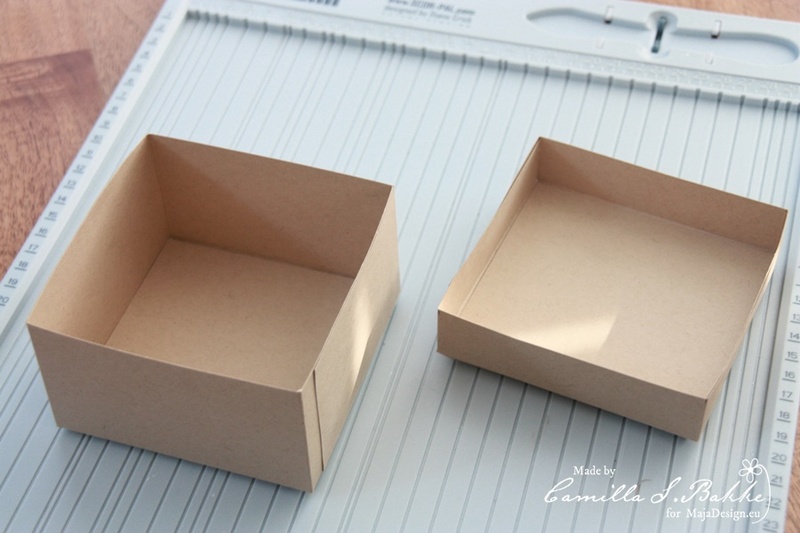 Then start with the lid on the box. 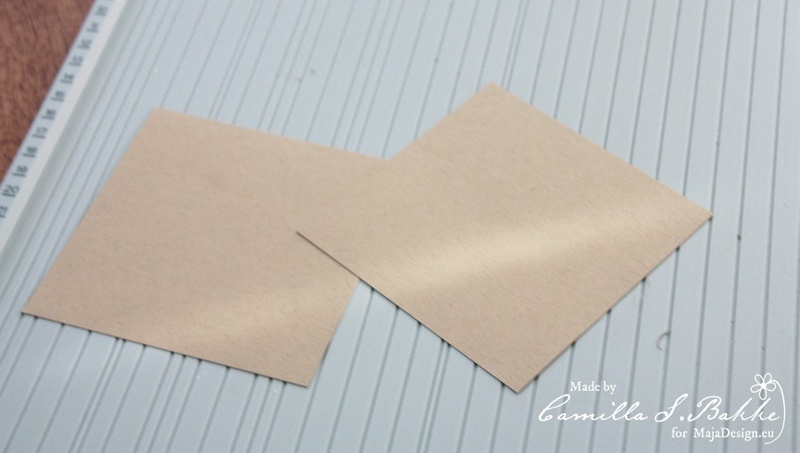 Cut out two papers measuring 4 x 30 cm. 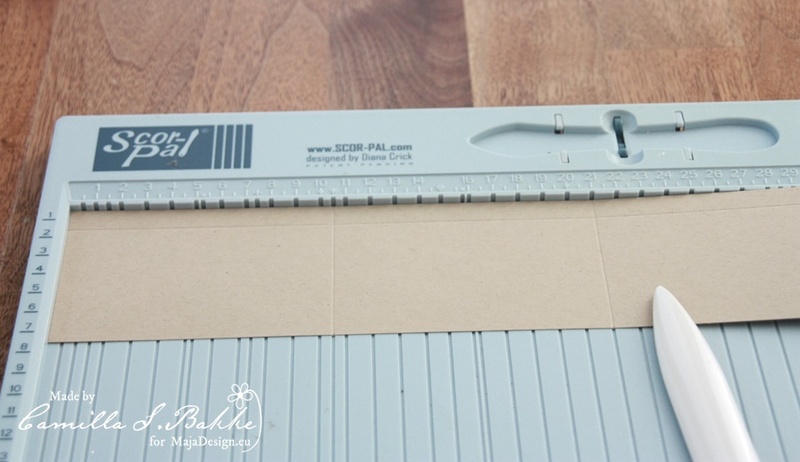 Also here fold at 1 cm first. Then fold the other way at each 10,6. This is because the lid has to be a bit larger than the bottom part of the box. Put the parts together like this. 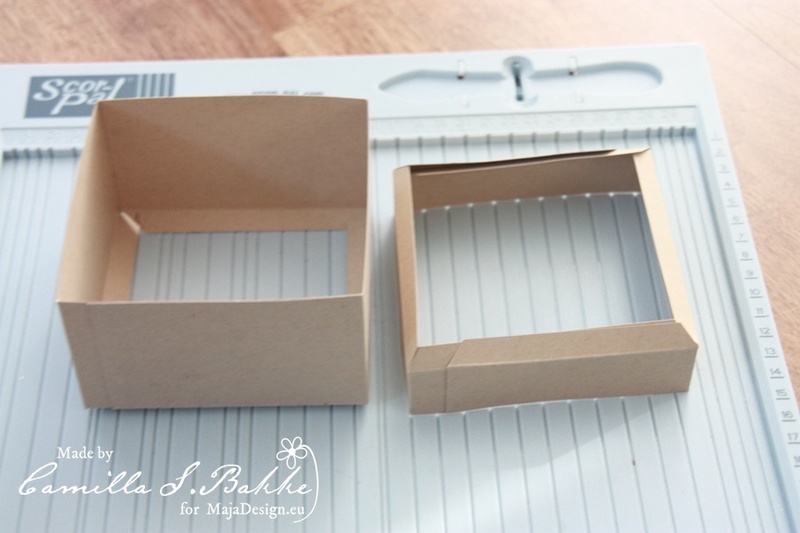 Cut out parts to fasten inside the bottom of the box and the lid. (10,4 x 10,4 and 10,5 x 10,5). 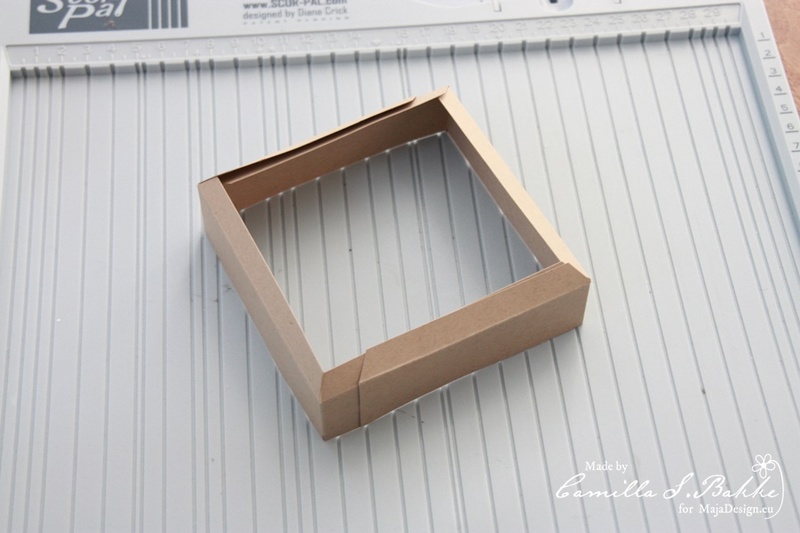 Then use the background die to cut out the bottom part and one on the lid. I use a harder cardboard for this. I also have painted the edges with white Gesso. 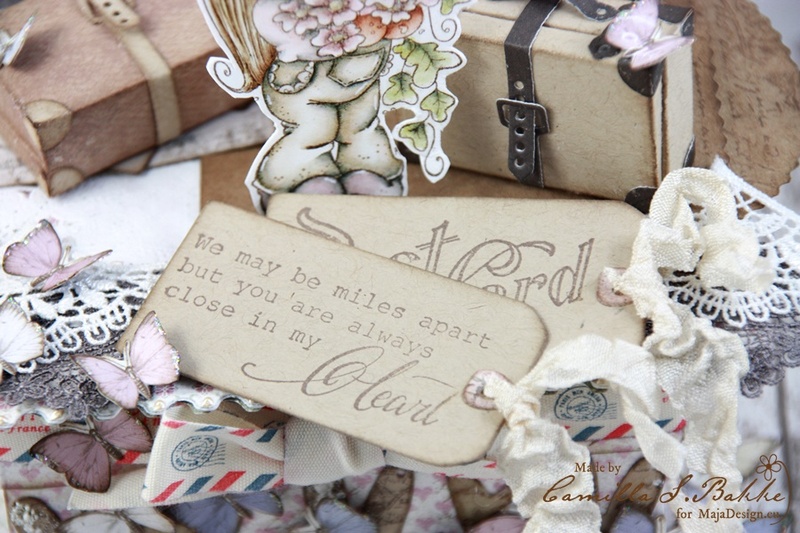 The lovely photos and letters are also Maja Design papers. Here with the lid taken of. Thank you so much for visiting today! Wish you all a wonderful Christmas, untill I am back for a new post the 28th of December. Hello dear friends, its Evgenia Petzer with you. 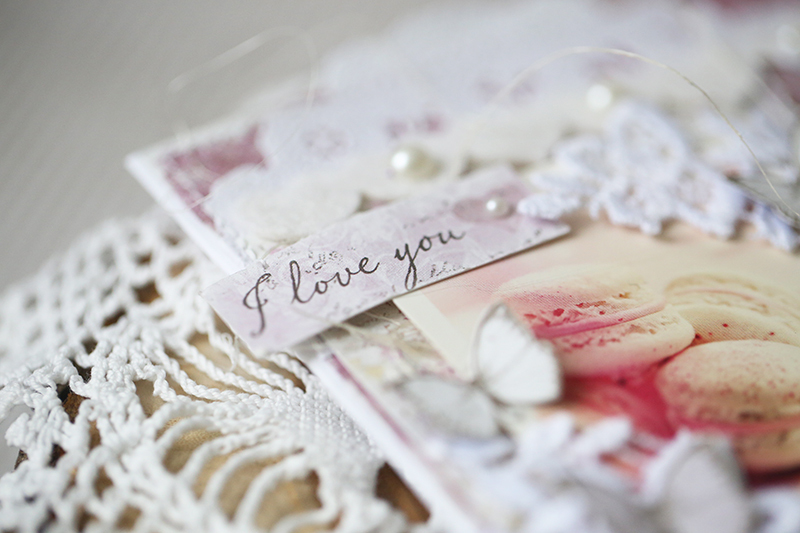 I am sharing today two sweet cards that are made from the Coffee in the Arbour collection. 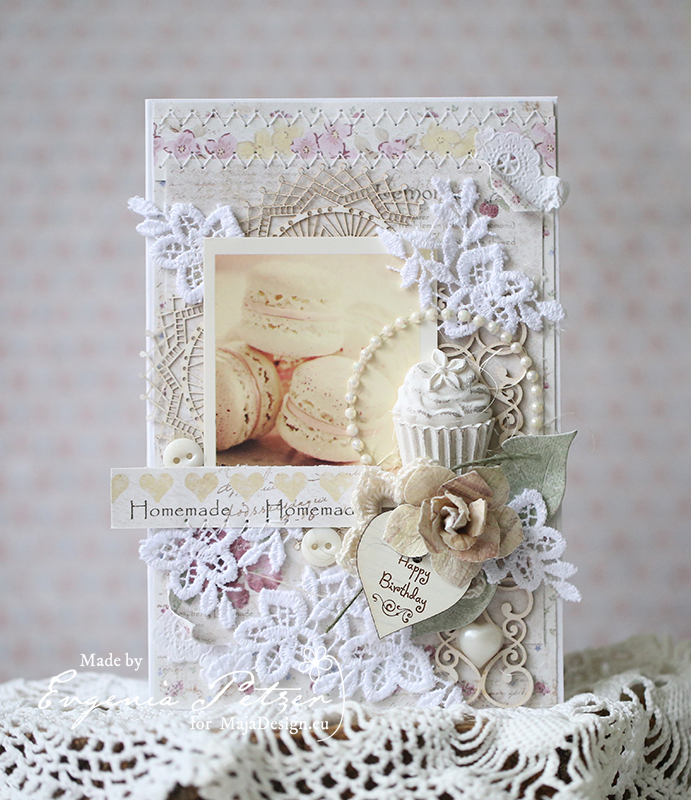 When it was just released it became one of my favourites, but I didn’t play with it for quite a while and this time my hands just pulled that paper pad out and then I found those images with macarons in my stash and the cards came out quite quick and easy. 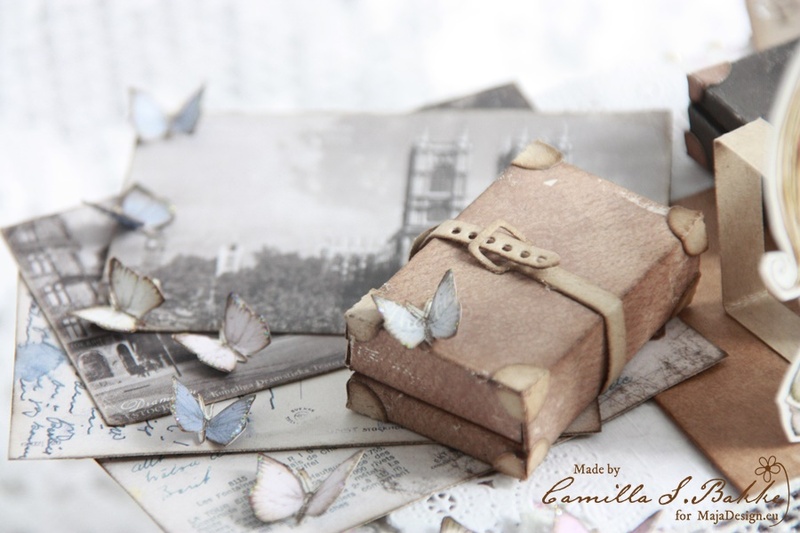 the butterflies are again fussy cut from the Maja papers. 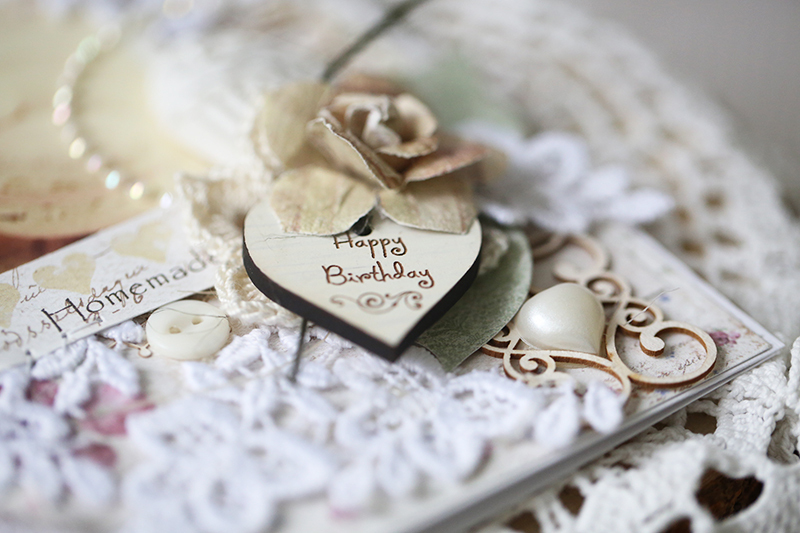 The second card is more in yellow tones, again some lace, chipboard and stitching. 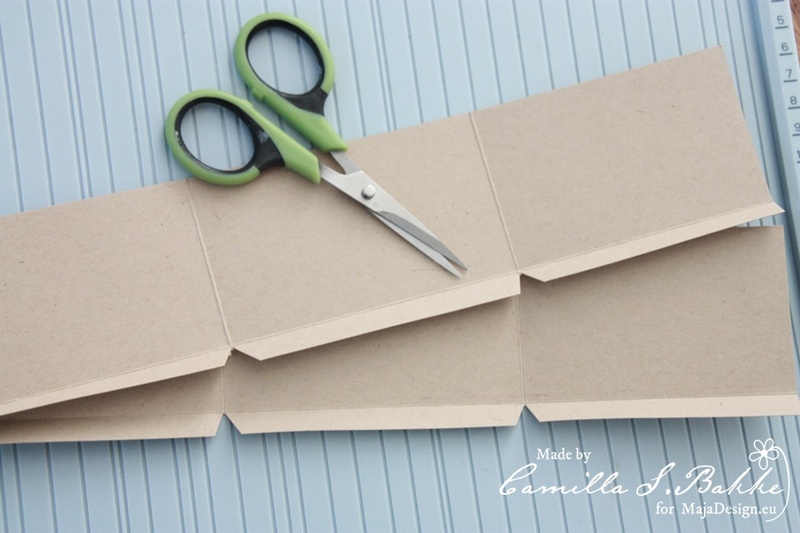 I love that Maja design papers have those little stripes of paper in the bottom with some matching designs or words, I often use them in my cards. Have a lovely weekend that is coming our way! 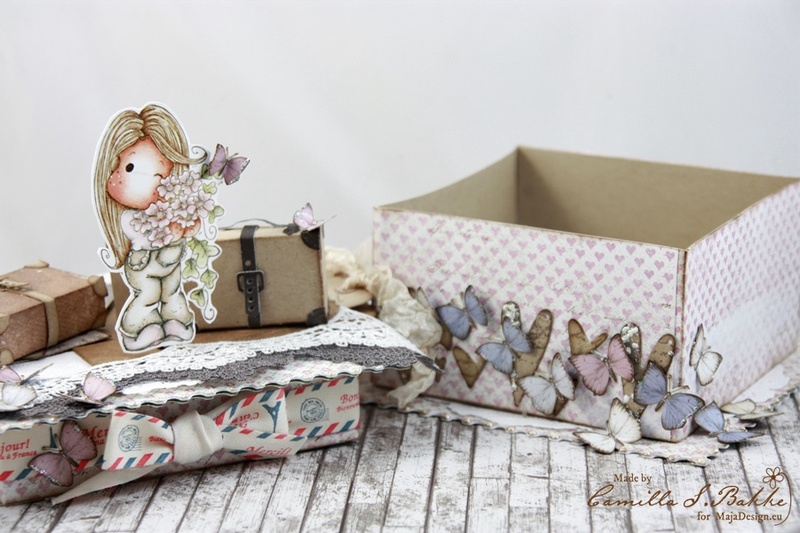 Hi, today I have my newest Maja Design layout to share using the Coffee in the Arbour collection. I love these yellow and maroon colours together, this is a very pretty collection. I used the Raspberry Lemonade paper as my background, first I cut a square out of the middle to back my photo on. Next I cut the sides off the Homemade Lemoncurd paper, I layered the cut pieces under the edges to give more interest. I added a little colour to my background with some dark pink and yellow splashes, then a Gelato through a grid stencil and modeling paste with a bubble stencil. 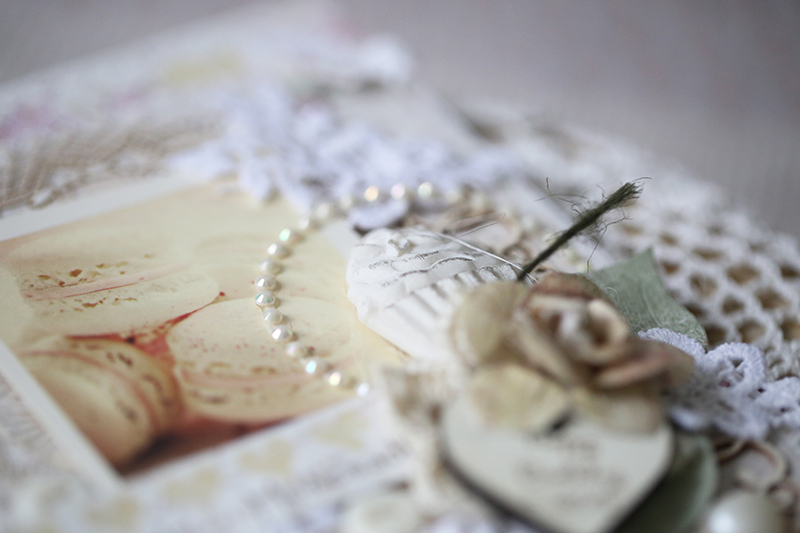 I layered some paper under my photo, as well as some lace and doilies. 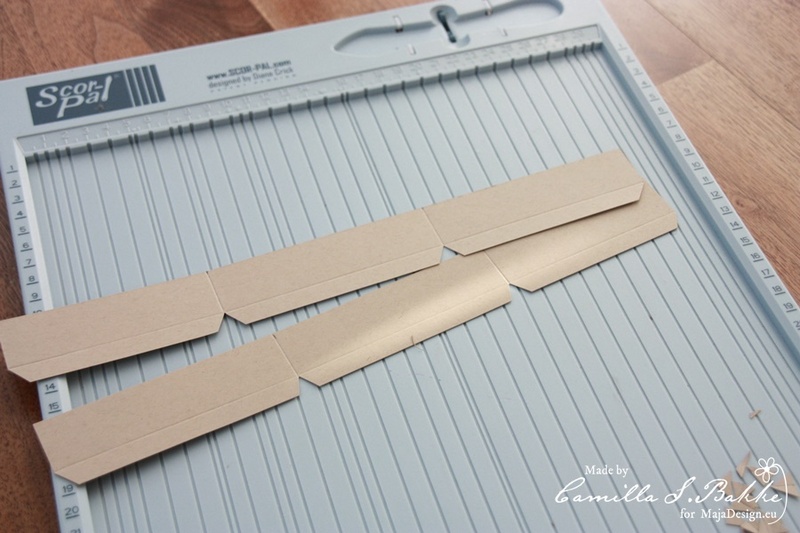 I cut two tag shapes from the Delicious Moments paper to also tuck under my photo. 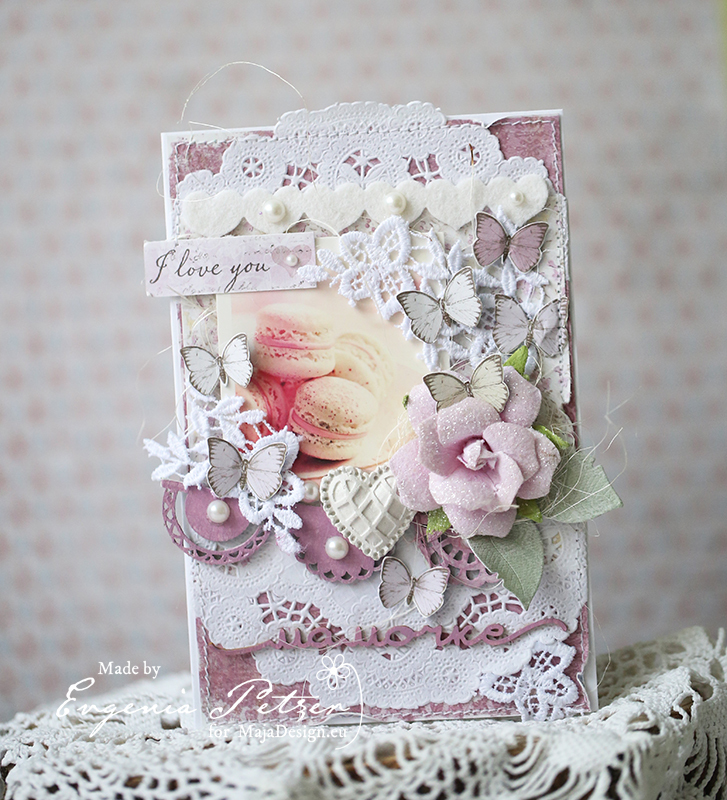 Finally I layered on a generous amount of flowers, chipboard and pearls.